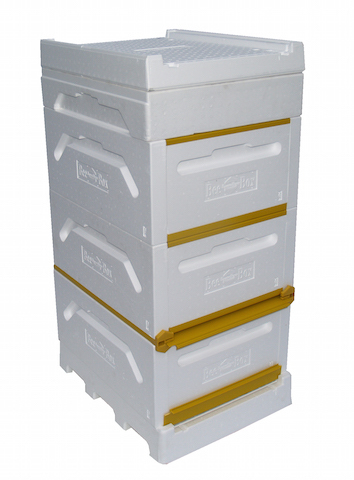 The Paradise Honey BeeBox polystyrene beehive system has been evolving to meet the challenges of Scandinavia’s harsh winters for over 30 years. The Paradise Honey beehives are manufactured using high-density expanded polystyrene to provide maximum protection from the extreme Scandinavian winters. Polystyrene beehives have been operated by Scandinavian beekeepers for decades because of their excellent thermal performance in the extreme cold and damp winters. The Paradise Honey polystyrene beehive has been field tested in the extremely hot climate of Australia with great success. Australian Honeybee began evaluating the Paradise Honey beehives in Australia alongside traditional wooden beehives in 2012. We operate our beehives in the hot climate areas of central New South Wales where summer temperatures reach over 46 degrees Celsius. In contrast to the wooden beehive, the performance of the Paradise Honey beehives has proven to be outstanding in these high temperatures. The excellent thermal performance of the Paradise Honey beebox means that the beehive requires much less water and cooling (fanning) is significantly reduced. This allows a much larger percentage of the beehive’s workforce to be dedicated to nectar and pollen foraging resulting in higher honey yields and more profitable beekeeping operation. By comparison, the performance of colonies housed in traditional wooden beehives reduces significantly in high temperatures because a large percentage of the workforce is diverted from nectar and pollen foraging to water collection and cooling activities to maintain the beehive at a safe temperature. Furthermore, a large percentage of the honeybees exit the beehive and hang outside, to avoid overheating the brood nest. This diversion of honeybee resources from nectar and pollen foraging activities reduces the honey production of the beehive in hot temperatures.